Hawaii; scale is 5 mm. 12 Aug 2011. J.M. Huisman. © J.M. Huisman. Hawaii; surface with conceptacle openings. 12 Aug 2011. J.M. Huisman. © J.M. Huisman. Hawaii; trichocyte fields (black arrow) and conceptacles (white arrow); scale 300 µm. 12 Aug 2011. J.M. Huisman. © J.M. Huisman. Published in: Keats, D.W., Chamberlain, Y.M. & Baba, M. (1997). Pneophyllum conicum (Dawson) comb. nov. (Rhodophyta, Corallinaceae), a widespread Indo-Pacific non-genienlate coralline alga that overgrows and kills coral. Botanica Marina 40(4): 263-279. 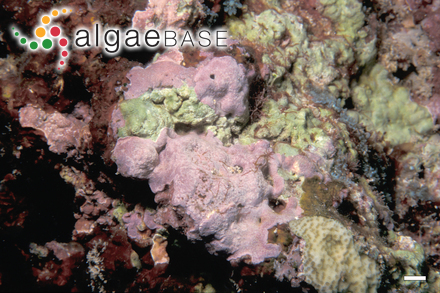 Type locality: Isla Socorro, Revillagigedo Archipelago, Mexico (Dawson 1960: 28). Type: Dawon 12148; Nov. 19, 1953; Intertidal reef at Binners Cove. US Dawson 12148 (Yoshida 1998: 609). Notes: An isotype is in Herb. A. Hancock Foundation. 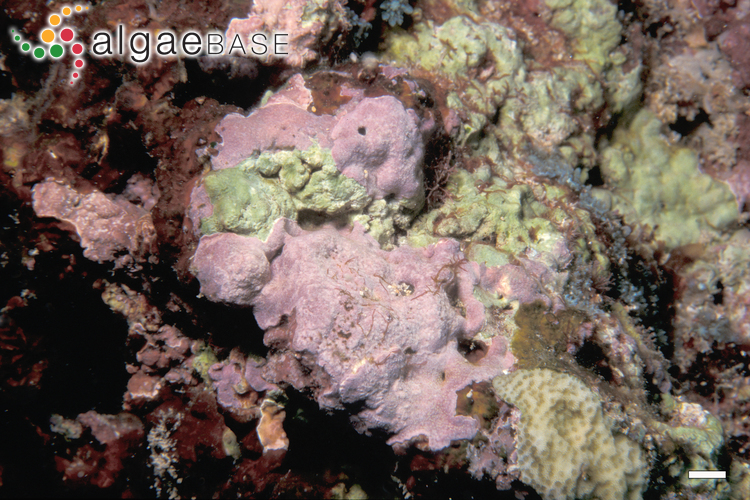 Type locality: Binners Cove, Isla Socorro, Revillagigedo Archipelago, Mexico (South & Skelton, 2003). Isotype: UC 1883778 (Caragnano et al, 2018). Amado-Filho, G.M., Bahia, R.G., Mariath, R., Jesionek, M.B., Moura, R.L., Bastos, A.C., Pereira-Filho, G.H. & Francini-Filho, R.B. (2018). Spatial and temporal dynamics of the abundance of crustose calcareous algae on the southernmost coral reefs of the western Atlantic (Abrolhos Bank, Brazil). Algae. An International Journal of Algal Research 33(1): 85-99. Jesionek, M.B., Bahia, R.G., Hernández-Kantún, J., Adey, W.H., Yoneshigue-Valentin, Y., Longo, L.L. & Amado-Filho, G.M. (2016). A taxonomic account of non-geniculate coralline algae (Corallinophycidae, Rhodophyta) from shallow reefs of the Abrolhos Bank, Brazil. Algae. An International Journal of Algal Research 31(4): 317-340. Mariath, R., Riosmena-Rodriguez, R. & Figueiredo, M. (2012). Lithothamnion steneckii sp. 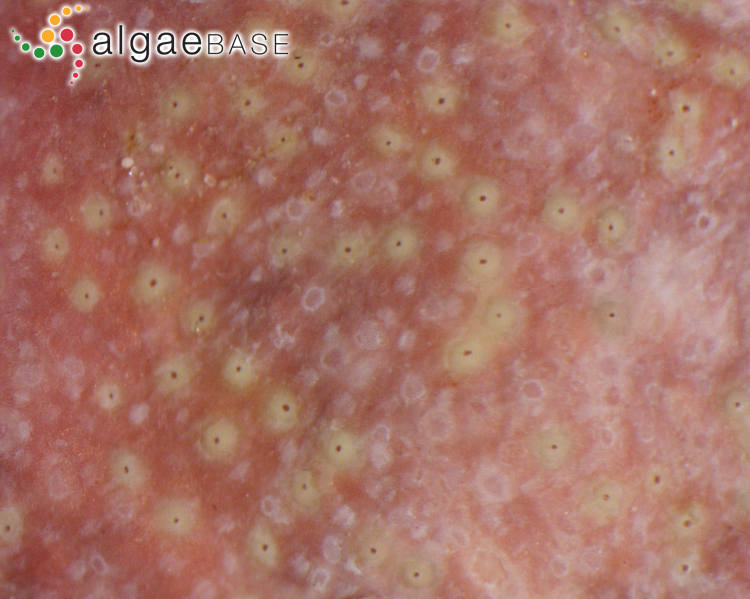 nov. and Pneophyllum conicum: new coralline red algae (Corallinales, Rhodophyta) for coral reefs of Brazil. Algae. An International Journal of Algal Research 27: 249-258. Accesses: This record has been accessed by users 1646 times since it was created. Keats, D.W., Chamberlain, Y.M. & Baba, M. (1997). Pneophyllum conicum (Dawson) comb. nov. (Rhodophyta, Corallinaceae), a widespread Indo-Pacific non-genienlate coralline alga that overgrows and kills coral. Botanica Marina 40(4): 263-279.